The 90s and trying out for the Iowa State football team as a kicker impacted Scott in a very positive way. As a kid what do you remember the most? My first love was basketball (the NBA) and sports in general, which consumed most of my younger years. I was active in every sport growing up. From collecting thousands of cards and jerseys to spending hours shooting hoops, my dream was to someday play in the NBA. I also enjoyed drawing - mostly recreating NBA team logos and football helmets. I had a ton of practice in drawing the Chicago Bulls logo as they were huge in my world as a kid. Why do you call Des Moines home? The transformation of Des Monies over the years has been tremendous. As a kid in the mid-90's there really wasn't much happening downtown. Aside from the occasional visit to Nacho Mama's or Spaghetti Works or attending a very rare occurring NBA game at Vets Auditorium (I got to meet Dikembe Mutombo! ), downtown wasn't even close to what it is today. Now, we have essentially everything available in the bigger cities and it's affordable. There's a lot of pride in Des Moines and Iowa as a whole and people are super supportive of things they can identify as their own, which is part of the reason I started DRMN BG. I wanted to create a clothing line that Iowan's could label as theirs. "As a kid in the mid-90's there really wasn't much happening downtown." Walk us through your journey to starting your own thing. I have always been somewhat of an entrepreneur. Starting in high school, I remember asking for a CD burner for Christmas so that I could create my own CDs, which I eventually sold to classmates. In the back of my mind, I always wanted to create my own t-shirts and part of that was due to what was available in Des Moines. In the mid to late 90's, Mossimo, Airwalk, FUBU (which may have made an appearance in my closet) were huge at my school and then the Tommy Hilfiger's, Nautica's, Polo's became a trend. Regardless, the probability was high that you'd run into a classmate wearing the same shirt as you, which was kind of a drag. Due to this, I wanted to either access something unique or create it, but I had no idea how. Fast forward to my college years, I created a few tailgating t-shirts featuring a wooden goose planter, which a group of friends had adopted as our mascot (random, I know). Little did I know, this would become the brainchild of DRMN BG. From there, I started creating parody t-shirts for the major college sport teams in Iowa. Knowing these novelty designs didn't have a long shelf life, I wanted to create a lifestyle or casual brand which focused on inspiring people to dream big, to take action, to try new things, to find their edge and take a step away from the rigors and demands of their normal everyday lives. And in 2011, DRMN BG was born. I created close to 30 DRMN BG designs (many of which will never see the light of day) and actually offered most of them to a friend who had hired me to create designs for his brand. I kept creating and eventually put together 3-4 designs that I felt were ready to be made public and in 2014, DRMN BG was finally unveiled. 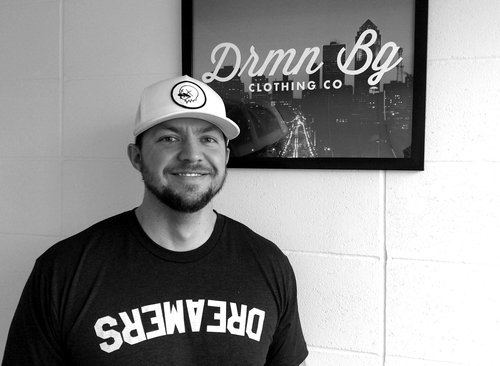 When you see someone with a DRMN BG shirt what do you think about? It's an exciting feeling, no doubt, especially if it's someone I don't know because then it's a complete surprise to me as the first thing I notice is the shirt. This also makes for an easy conversation starter. Along the way, who and what helped you to keep pushing forward? For one, the support of my friends and family. I can't thank them enough for all the support. I never envisioned this but DRMN BG has created an avenue for me to meet new people that share similar interests and identify with the ideals of DRMN BG's mission. I'd also say I possess an intrinsic drive to create and do something great and really never being satisfied or getting comfortable. It's also a pretty cool and rewarding feeling when a stranger from across the country can identify with and support your work. But I also enjoy seeing people succeed and do well in their pursuits in life and I think this is one of the motivators to DRMN BG. "I always wanted to create my own t-shirts and part of that was due to what was available in Des Moines." Someone is starting a project for the first time, what would you want to say to them? Do your research and planning but make sure to be flexible. There will be things that happen that require you to adjust and alter your plan. When I launched DRMN BG, I wasn’t 100% ready but I needed to start. I finally said to myself, just go and if something goes wrong, adjust and keep moving forward. I couldn't tell you the number of times I have failed and I couldn't be more thankful for those failures because it makes the successes that much sweeter. It's all an experience and it's a ton of hard work but if it were easy, it wouldn't be worth it in my mind. Talk to us about one of your good days this past week. To be completely honest, they are all good days! I am very blessed to have an amazing family and friends and I truly try to make the best of every situation. And one of your not so good days. I really try to find the silver lining in everything which makes this tough to answer. Sure there are some days that are better than others but I also believe that I am in control of my own happiness. What was a defining moment that shaped your positivity? I think I am naturally a happy-go-lucky person but don't get me wrong, I have my not so positive moments like everyone else. For me, I try to make the best of each situation regardless of how good or bad it may seem, which is definitely easier said than done at times. I credit my overall optimism and work ethic towards athletics and walking on to the Iowa State football team as a field goal kicker in college. That entire process was a 2-3 year period of hard work and uncertainty where I didn't really know what I was doing as there wasn't a clear or known path to take. Once I got my opportunity at a tryout, I made the most of it and made the team which was a huge confidence boost overall to see so much hard work finally pay off. "It's all an experience and it's a ton of hard work but if it were easy, it wouldn't be worth it in my mind." What are you most proud of and why? Being able to create and use DRMN BG as not only a vehicle to inspire but also as a way to give back and help people. DRMN BG recently completed a $1000 Dream Giveaway - a promotion where customers submitted to win $1000 to be applied towards a dream of theirs. This was a really cool process as it provided me an opportunity to meet and develop personal relationships with the supporters of DRMN BG. The plan is to continue to offer these giveaways as the company grows, which is exciting for all. I genuinely want to encourage and to see people succeed and it's important to celebrate the big and small successes in life. What is one thing you can't leave home without other than your phone? There are days where I wish I could leave my phone at home because I tend to spend too much time on it as it is - haha! I'd have to say music as that is a big part of my everyday life. Someone just moved to the area. Where do they need to visit first? Downtown. There's so much to do there from the Sculpture Park in the Western Gateway to the dining and nightlife in the Court Ave area to the events at the Civic Center and Iowa Events Center to the shopping and live music in the East Village, there's something for everyone. If you could grant the Des Moines one wish what would it be and why? I wish Des Moines nothing but continued success and growth in providing us with a diverse offering of activities. What’s one thing people need to know you really care about? At the end of the day, I am trying to make the most of every opportunity I get and if I can help other people along the way, I am all for it.